For more than 60 years, Accounting for Governmental & Nonprofit Entities has been the leader in the market. 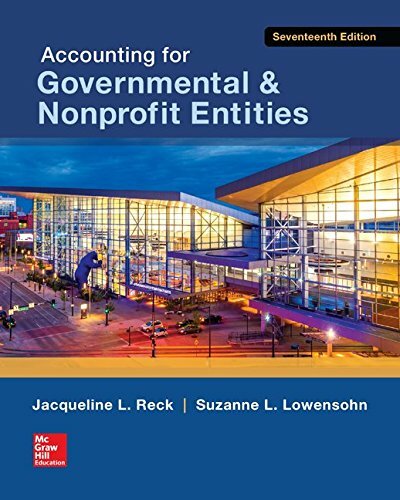 It is a comprehensive governmental and not-for-profit accounting text written for students who will be auditing and working in public and notfor- profit sector entities. Originally published in 1951 and written by Professor R. M. Mikesell, this book―and the many subsequent editions revised by Professors Leon Hay, Earl Wilson, Susan Kattelus, Jacqueline Reck, and Suzanne Lowensohn―have given generations of instructors and students a comprehensive knowledge of the specialized accounting and financial reporting practices of governmental and not-for-profit organizations, as well as an understanding of how those organizations can better meet the information needs of a diverse set of financial statement users and decision makers. The vision of these original authors continues to be reflected in this 17th edition, and their strategy of providing a large and innovative set of instructional support materials prepared and tested in the classroom by the authors continues to be a guiding principle today. The current author team brings to this edition their extensive experience teaching government and not-for-profit courses as well as insights gained from their professional experience, scholarly writing, and professional activities. The result is a relevant and accurate text that includes the most effective instructional tools.